Microsoft is making a big change to the way it does business with the product at the core of its business: the Windows operating system. You might even say it’s the end of Windows as we know it. We’re a little over a week away from the official launch day of Windows 10, and Microsoft is saying that this will be the “final” version of Windows – because it will never officially be replaced. Microsoft is done with their conventional model of a new version of Windows coming out every few years and replacing the one that preceded it. Instead, Windows 10 will be continually updated – for free – with new tweaks, fixes, and features every couple of years, pretty much the way… well, we’ll just come out and say it: pretty much the way Apple does things with OSX. The best part is that to get everybody on board with this new paradigm (and probably to try to win back some good will lost in the Windows 8 debacle), Microsoft is giving away Windows 10 as a free upgrade for existing Windows users… most of them, anyway. Not sure if you’re going to be able to get in on the free upgrade? Here’s the simple rundown. Current users of Windows 7 Starter, Windows 7 Home Basic, and Windows 7 Home Premium will receive a free upgrade to Windows 10 Home. If you’re running Windows 7 Professional or Windows 7 Ultimate, you’ll receive a free upgrade to Windows 10 Pro. The Enterprise version of Windows 7 is not eligible for a free upgrade, as this edition was geared toward use by large companies which usually have their own licensing agreements with Microsoft. Current users of Windows 8.1 will get upgraded to Windows 10 Home. If you have Windows 8.1 Pro or Windows 8.1 Pro for Students, you’ll receive Windows 10 Pro. If you’re still on Windows 8, you need to do the free upgrade to Windows 8.1 before you can get your Windows 10 upgrade. The Enterprise edition of Windows 8/8.1, like its Windows 7 counterpart, is not eligible for a free Windows 10 upgrade. Windows RT was a stripped-down version of Windows 8 primarily intended for tablets. Very few devices using this OS were ever produced, and they won’t be getting any Windows 10 upgrade, although Microsoft has promised that devices on RT would receive their own upgrade incorporating some of Windows 10’s changes. Don’t laugh! At least not too hard. Stats from two major market share tracking companies show that nearly 17 percent of people worldwide, and about 6.5 percent in the United States are still using Windows XP… despite the fact it’s now 13 years old and hasn’t been officially supported by Microsoft for a year. XP is still going bangbusters compared to Windows Vista, which has less than 2% of the market share. None of these people will get a free upgrade – if you’re on any version of Windows older than Windows 7, then it’s no free Windows 10 for you. If you’re one of those XP holdouts, or maybe even one of the rare breed who was alright with Windows Vista, now is as good a time as any to upgrade! If you’re confused by the distinction between Windows 10 Home and Windows 10 Pro mentioned above, don’t sweat it too much. Windows 10 Home is the “consumer-focused” edition of the OS for PCs, tablets, and 2-in-1 devices. Windows 10 Pro includes all of Windows 10 Home’s features but includes a few extra bells and whistles that could be useful for small business, such as tools to log into and control a PC remotely. There are also specialized versions of Windows 10 for large business organizations (Windows 10 Enterprise) and for schools (Windows 10 Education), in addition to Windows 10 Mobile and Mobile Enterprise for Windows Phone smartphones. If you want a more detailed rundown of all the various Windows 10 flavors, you can check out this article at TechRadar. However, if are just running Windows 7 or 8/8.1 on your home PC or your tablet, then all you really need to know is that you’ll get a free upgrade to Windows 10 Home or Windows 10 Pro. Windows 10’s official launch, and the start of the free upgrade rollout, is July 29. Current Windows users will have one year from that date to take advantage of the free upgrade offer. If you’re using Windows 7 or 8.1, you may have already noticed a small Windows logo icon in your system tray that prompts you to “reserve” your free copy of Windows 10. The use of the word “reserve” is a little misleading here, but don’t worry – it’s not as though there is a limit to the number of free Windows 10 upgrades available (the only limit is the one-year window). If you agree then Windows 10 will be downloaded automatically come launch date. You don’t have to install it or even download it right away if you don’t want to; you’ve got one year. After that, Windows 10 Home will cost $119, and you’ll have to shell out $199 for Windows 10 Pro. We’re very excited about the launch of Windows 10 and Microsoft’s change to a business model of continual free OS updates here at Computer Gnome, and we hope this post has you excited too. 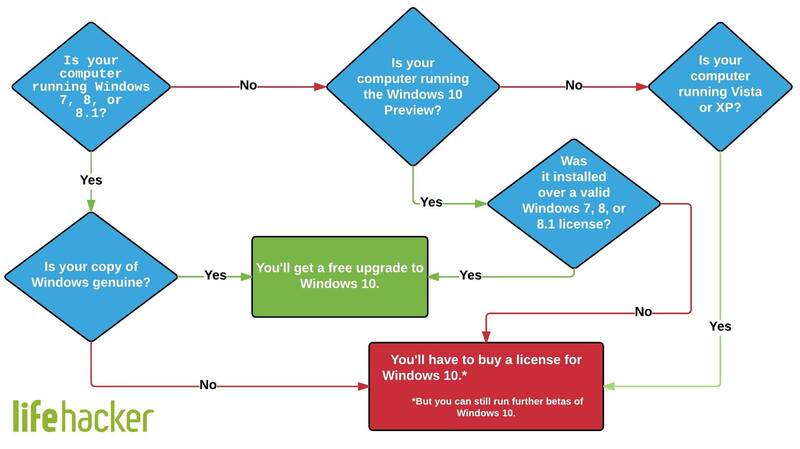 But if you’re still confused about what Windows 10 is, how it will work, and whether you can get a free Windows 10 upgrade, give Computer Gnome a call today! We’re happy to answer questions and walk you through the upgrade process come release day. The Computer Gnome Windows 10 Review, Pt. 3: Chock-full of Features!